This site is dedicated to the study and appreciation of one of the most celebrated episodes of the 1970s post-apocalyptic BBC TV series 'Survivors' — the third series classic Mad Dog. The episode was seen by almost 7.5m viewers when it was broadcast on 6 April 1977. 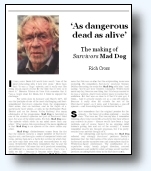 Though never repeated on the BBC, Mad Dog has been transmitted (as part of the full run of Survivors) five times on the cable-satellite channel UK Gold between 1993 and 1998. In 2005, the third series of Survivors was released on a four-disc DVD set. Download As Dangerous Dead as Alive an exhaustive account of the making of Mad Dog, featuring new interviews with actors Denis Lill and Morris Perry, scriptwriter Don Shaw and director Tristan de Vere Cole. Review a range of material on the production of the episode, including correspondence and interviews with actors and production staff; character studies and acting credits for the principal cast members, production credits and a range of reviews of the episode. 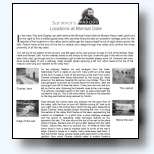 View clickable maps of the three locations where Mad Dog was recorded — Ilam and Monsal Dale in Derbyshire, and the Severn Valley Railway. Alternatively, view of each of the locations scene-by-scene. Photographs of the filming locations in the present day are matched with screen shots from the episode itself. Details on 'unseen' and 'lost' locations are also provided. Download illustrated 'walkthroughs' of all the Mad Dog filming locations — Ilam and Monsal Dale in Derbyshire, and the Severn Valley Railway (.pdf format, requires Abode Reader). Find information on accommodation in the area and details on how to reach the separate locations. Organised fan trips around the filming locations for Mad Dog have been held in 1998, 1999, 2000, 2002, 2003, 2006, and 2007. The most recent Mad Dog location trip took place on 18-19 October 2008 — see the illustrated report here. The locations in which Mad Dog was recorded also feature in two other TV productions from the 1970s. Discover the connections between Mad Dog and the 1972 Granada TV Country Matters drama 'The Watercress Girl' and between Mad Dog and the 1972 BBC2 Drama Playhouse series pilot 'The Incredible Robert Baldick' — scripted by Survivors creator Terry Nation. Learn about the real-life history of the plague which devastated the Derbyshire village of Eyam in the seventeenth century. Study a 'clickable' map of the main 'plague' landmarks, read reviews of a fictional and factual history of the plague outbreak and access a feature on the 1973 BBC2 play 'The Roses of Eyam'. Find out about the influence that the Eyam story exerted over Survivors scriptwriter Don Shaw's work on the series through an assessment of his script for Greater Love and a review of the series two episode. Mad Dog available on Series 3 DVD: with commentary! Mad Dog is now available to buy on DVD, following the release of Survivors third series on a four-disc, twelve-episode DVD set (see link below, left), complete with an exclusive commentary track. Read more about the recording of the Mad Dog audio commentary here; and of the presentation and subtitling of the episode here. Site editor Rich Cross, can be contacted here. Check out the site map, here.